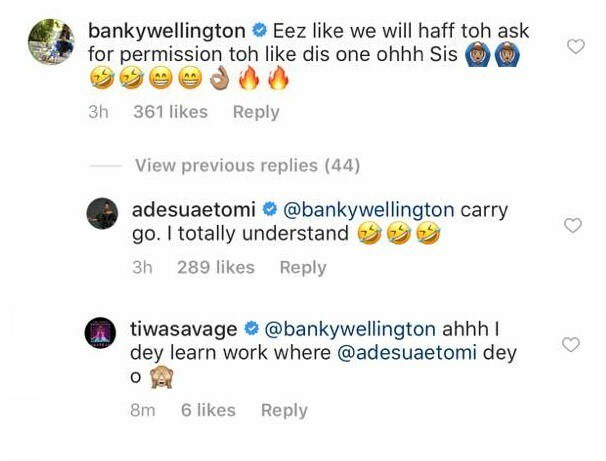 Banky Wellington has subtly asked for permission from his beautiful wife Adesua, to like a raunchy photo Tiwa Savage shared on her page. The photo is a clip from Tiwa’s new video, Get it now. Meanwhile, Banky Wellington celebrated Adesua today, as she turned 30. The singer/actor took to his social media platform to pen down a beautiful birthday piece to Susu. “Today is #BaeDay… Susu.. on the inside and out, you are UNQUESTIONABLY the most beautiful person I know. Thank you for making me the luckiest man on earth. Thank you for loving me, and being my backbone. Thank you for going on this journey with me and making the past few months, unquestionably, the best of my life. You mean the world to me and I love you more than words could ever properly express. As the whole world celebrates you today, I pray that God will bless, protect and guide you. May He enlarge your coasts, grant you heart’s desires, and overwhelm you with His Grace and Favour. Happy birthday Mrs W. You were worth the wait.